Mustang is available in 6 different colors - Onyx Black, Ingot Silver, Oxford White, Magnetic, Race Red and Triple Yellow Tri-coat. Watch latest video reviews of Ford Mustang to know about its interiors, exteriors, performance, mileage and more. There are few cars in the history of automobile that enjoys a legacy and Mustang is one of them. Mention the muscle or performance car in India that makes one scream in excitement and one of the name that would pop-up in the mind would be Ford Mustang. The car is an icon, a machine that attracts envy but more than that a performance vehicle which has attractive styling and ample opportunities for personalization. Ford India brought the iconic car in India 51 year after its first international launch. Ford has sold around 9 million units worldwide, it sells more in USA than Honda City in India. The car gets retro inspired outer design and the large snug cabin with plethora of advanced features making it a perfect admirable car. The pony car is powered by a mammoth naturally aspirated petrol mill that comes mated to 6-speed automatic gearbox. On the outside, Ford Mustang retains the brawny looks and muscular styling. It took six-generation for the Mustang to come out and offer iteration for the right hand drive. After waiting for so long for the launch none of the original charm has been lost. 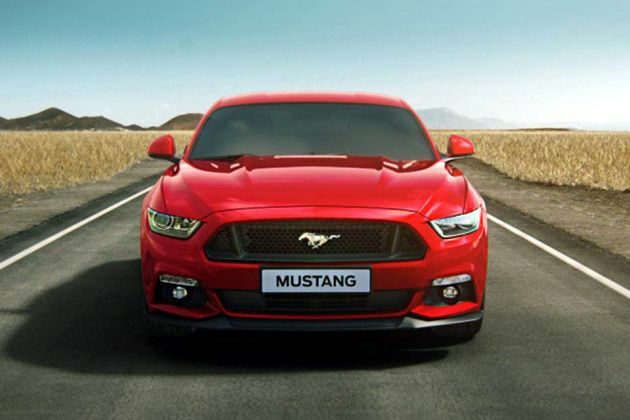 On the front, Ford Mustang features the sharp projector headlamp with LED daytime running lights, it gets a trapezoidal radiator grille with large air-dam that creates a hexagonal shape. Other beefy element that increases the overall appeal of the car is the slopping coupe like roofline. On the sides, Ford mustang rides on the attractive 19-inch Magnetic gloss painted machined aluminium wheels. At the back, the car gets sloping windshield and rear glass. Dimensionally, Ford Mustang measures 4784mm in length, 2080mm in width, 1391mm in height and gets the overall wheelbase of 2720mm. The boot space stands at 383L while the ground clearance is at 137mm. Talking about the colour schemes, Ford Mustang is offered in 6 graceful shades such as Oxford White, Triple Yellow Tri-Coat, Ingot Silver, Magnetic, Race Red and absolute Black. Coming to its interiors, Ford Mustang is designed to accommodate even the tall passengers with ease. The car has the hefty build up along with the well-supportive large seats that offers amazingly comfortable ride. Technically, it’s a four seater car but back seats are strictly suited for kids. The most amazing things inside is that Ford has retained the original 1964 Mustang’s design that is the most attractive part inside the cabin. The car features the twin-cowl dashboard and retro style toggle switches, three spoke steering wheel along with round horn pad in the middle. In terms of gadgetry, Ford Mustang gets 8-inch SYNC 3 infotainment system with touchscreen and 9-speaker sound system with amplifier, Bluetooth and voice control. The car also comes with comfort features such as electronic line-lock, HID projector headlamps cruise control, push start/stop button, electrically adjustable rear view mirror, 6-way power adjustable driver seat, Front 4-way Adjustable head restraints, Electrochromic/Auto Dimming Rear-View Mirror, Ambient Lighting, Front Seats - Heated/Cooled, paddle shifters, climate control, lumbar support, split fold second seat and one-touch power windows up and down. Under the hood, Ford Mustang houses the most powerful 5.0L petrol engine. The humongous powertrain is capable of generating the power output of 395bhp and the maximum torque of 515Nm. The engine comes mated to 6 speed automatic gearbox. In terms of fuel efficiency, Ford Mustang returns the mileage figures of 13.0kmpl. The vehicle is available in four different drive modes: Normal, Sport, Sport+ and Wet/Snow. The India-spec model of Ford Mustang has been de-tuned so that it can run on the regular petrol fuel. That makes it quite low in power as compared to its international counterparts. As for the riding, Ford Mustang offers comfortable riding experience. For the safety, Ford Mustang comes equipped with the advanced aspects. The list includes 8 airbags, programmable key, ABS, Electronic Brake force distribution, Brake assist, Hill Assist, ISOFIX Child Seat Anchorage Points, Electronic stability program, traction control and automatic headlamps. Other features are cornering lights, Pull-drift Compensation (EPAS) and Front Seatbelt Pretensioners. Ford Mustang is available in only single variant in India which is the Mustang V8. As per the pricing, it’s quite expensive in India. The Mustang V8 trim gets the price tag of Rs. 74.62 lakh. At such a price tag it loses its place to call it as an affordable car but it does buy you something special. As per the competition, Ford Mustang goes against the likes such as Audi TT and Mercedes-Benz SLC. Hop on to the driver seat and the very first thing you will experience is the big smile on your face. And what makes that cheery feel is the big bonnet at the front which is a rare sight in these days. Another surprising thing is that the overall visibility from the driver’s seat is quite decent with the only drawback being the smaller wing mirrors which should have been double in size. Talking about the sheer size, the car has been crafted to accommodate tall passengers. So, even if you are over 6-feet tall with hefty build, you will be comfortable enough get nice support in the large seats. Though technically the car is a 4-seater, the rear seats are best suited for kids. Not only the rear seats have limited head, leg and knee room but also accessing them is a bit difficult due to narrow space and sloping roofline for entrance. Even adults of average height will find their heads touching the roof. But what is really amazing is how the carmaker has retained the original design traits and that too, over 50 decades later. The three-spoke steering wheel with a round horn pad at the centre welcomes you once you get seated on the driver seat. Along with this you get a dual-cowl dashboard and retro-styled toggle switches on the steering to operate different driving modes such as Normal, Sport+, Track and Snow/Wet and steering modes including Normal, Comfort and Sport. You also get switches for traction control. And the car is pretty much at your command. And despite all the retro elements out there, the cabin is equipped with modern convenience aspects including 6-way electrically adjustable driver seat, dual-zone climate control, one-touch power up/down windows and cruise control. The central console is flanked by touchscreen infotainment unit with decibels powered by 9-speakers sound system with amplifier. The infotainment also let you connect your smartphones via Bluetooth and also give access to vital functions through voice control. The infotainment is powered by Ford’s SYNC 2, so no Android Auto and Apple CarPlay stuff. Other comfort features in the car include front seats - heated/cooled, electrochromic/auto dimming rear-view mirror, ambient lighting, electric rear window defroster, leather wrapped steering wheel, head restraints - front 4-way adjustable, lumbar adjust - driver & passenger (static for passenger) and split fold second row seats. Further in terms of premiumness, there isn’t much to grumble about as the fit and finish isn’t on par with the German counterparts. A lot of hard plastic has been used across the cabin reminding you that Mustang is an expensive car in India though it has been crafted to be an affordable performance vehicle. The clocks in the car are in sync with the theme and the tachometer and speedometer sits between two large chrome ringed pods. The chrome lends the car a dash of classic look. The carmaker has also retained the signature handbrake lever which does add to the rich feel. The bucket seats give ample support and cushioning inclining more towards the latter which is also an indication how comfortable they are. In terms of utilities, there are 2 cup holders at the center console, locking centre console bin, power - 12v outlet (centre console) & under centre stack and split-fold functionality in the second row. The Mustang has been there since six generations and an icon in the automotive world. The car is now finally offered in the right hand drive nation and though Indian folks had to wait for long getting hands on this muscle car, the old school charm hasn’t been lost. The formula being the same; put a powerful engine under a two-door coupe and drive the rear wheels. If you inspect it closely, each and every inch of this car is pure muscle with length being over 5-meters, the width being greater than that of Ford Endeavour. So, the street cred and the strong road presence can be counted as feature on the brochure. Up front, there is wide and aggressive grille with the signature badge at the center which is enough to give an idea to the passer-by what he is looking at. The dominating grille is now flanked by narrow and vigorous HID headlights. The beefy bonnet bulges out prominently which clearly indicates that there is massive engine lying underneath. The side features 19-inch wheels which look menacing while the sleeker profile with sharply sloped windscreen and rear glass enhances the sporty quotient. The rear is stubby and the vertical tri-slat LED tail lamps retain the design legacy. There is also a GT badge in the middle section which is finished in gloss black. The twin-exhausts comes as standard while the diffuser in the middle is body coloured. The vehicle with all his muscular characteristics certainly stands out on the Indian roads and when viewed from any angle, it’s a good attention magnet. Asking for fuel efficiency in a performance car is behaving like a devil. But as the Indian version of Mustang has been detuned to be run on regular petrol, you can expect around 7-8kmpl for a litre of fuel. In the history of Mustang, this is the first time when an all-independent suspension system has been used and while you are cruising this does help to a great extent. Though the handling is fine but the car tends to roll a lot. But for a car in this category, the Mustang is absolutely comfortable. It can bear any surface that aligns to its nature right from national highways to narrow bylanes. In fact, one can actually use this car as a daily commuter without any problem. The car gets 137mm of ground clearance which is though not enough given our road conditions, but most of the time the fear of scraping wouldn’t bother at all. Coming back to the handling, the previous versions of Mustang didn’t enjoy the reputation of being a good handler but the sixth-generation which we have got here is a bit different. It isn’t dynamically perfect if we honestly put, but while driving you will experience a sense of excitement. Pushing the cars into the corners is definitely a fun, especially looking at the fact that the steering is well-weighted and communicative. But don’t mistake it to be as sprightly as Audi TT, BMW Z4 or Porsche Cayman as the car’s weight is evident when you try to exit the corners at higher speeds. Internationally, Ford Mustang is available with multiple engine options including 2.3L, 4-cylinder, 3.5L Ecoboost and the most powerful of the lot the 5.0L V8 engine which the Indians enthusiasts get. Start the engine and the first thing you will notice is that the powertrain is quite silent. There is a deep-toned gargle when it’s in the idle state and it’s not loud as you would expect in a muscle car. So, whether you blame the emission norms or the noise regulations, but seriously you would have wished that the car should have sounded a bit wilder. But one thing that everyone should know is that this car isn’t made for someone who would like to go unobserved. Irrespective whether you are pottering in the cities or munching miles on the highways, the eyeballs will definitely follow as soon as the car gets past. Some may even get closer to snap some pictures but if they get too close, just smash the pedal and witness the 515Nm of torque turning everything blur behind you. The naturally aspirated motor produces 401PS and while that’s a huge number, it’s easy to manage. The power is delivered in a linear fashion, so the performance won’t slam your head into the headrest. And as long as you admire the fact that this is a powerful performance packed car, you can enjoy the thrilling experience in every conditions. In terms of acceleration, the car dash from 0-100kmph in around 5.36 seconds which is definitely quick, but not that blows your mind. And in conjunction with the 6-speed automatic transmission, you can expect the car to reach the electronically limited top speed of 250kmph. The 6-speed dual clutch automatic transmission is a good companion and offers relaxed gear changes and not erratic either. However, if you are among those who love spirited driving, then don’t expect that kind of response from the gearbox. Whether you bang the pedal down or use the paddle shifters on the steering, the gearbox won’t be offering lightning quick performance. For people who love to have full throttle driving, the continuous lazy response can get annoying and you would be direly missing the manual gearbox. With all round disc brakes, the vehicle can ensure upright stopping power. But if you are repeatedly smashing it hard on the track, the fading of brakes can occur. And what could be more worrying is the fact that after thrashing the car continuously to 3-4 laps, the engine could overheat and go into the safe mode. So, this underlines the fact that this car is absolutely not meant for track racing. In terms of safety, the Mustang is equipped with top notch aspects including 8 airbags, ABS with EBD, Brake Assist, Cornering Lights, Pull Drift Compensation (EPAS), ESP, traction control, ISOFIX child seat anchorage and Hill Assist. What is the price of Ford Mustang? On road prices of Ford Mustang V8 in New Delhi is costs at ₹ 74.62 Lakh. What are the colors options available in Ford Mustang?